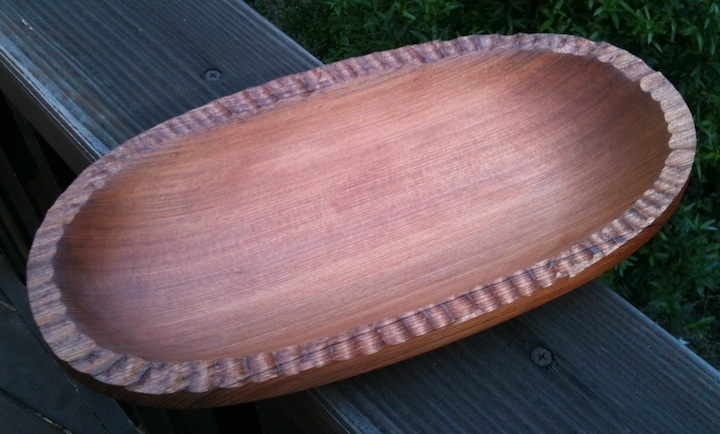 Another of the lessons in Paul Seller’s first DVD is carving a bowl. It’s a logical step from spoon carving. I only had smallish gouges from a carving set I’ve had for ages, so I picked up a couple of larger gouges. 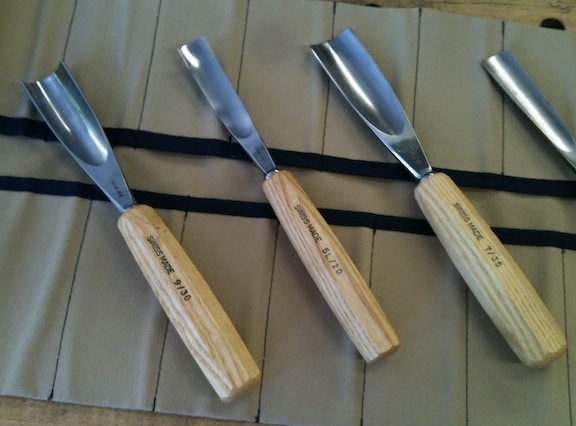 You can see the sizes on the handles, for example the one on the left is a 9/30 — a #9 sweep 30mm wide. I’m going to try this using a hunk of Redwood I had laying around. I started by gouging out the recess for the bowl. 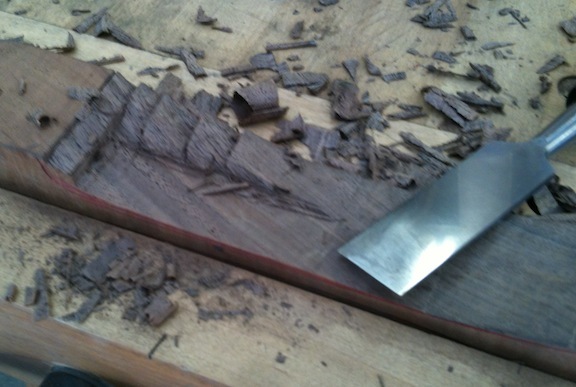 Working across the grain seemed to be the best bet for removing the bulk of the material and maintaining control. 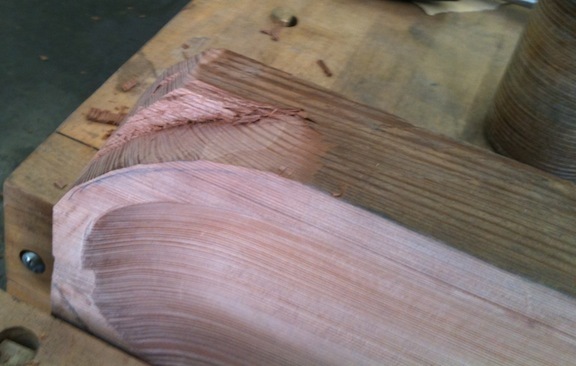 Cutting along the grain caused uncontrollable splits. This was not a great piece to work with and it tended to split and crack. I persevered, and after scraping and sanding had a presentable bowlish recess. I carved the interior of the bowl first so that I had a square part to clamp in place. Clamping was a major problem with this project. I tried to hold the blank using the end vise to clamp it against dogs on the bench top. The end vise ripped out of the bench, what a piece of junk. I think it’s officially time to get back to building my work bench, the legs have to be dry now, right? 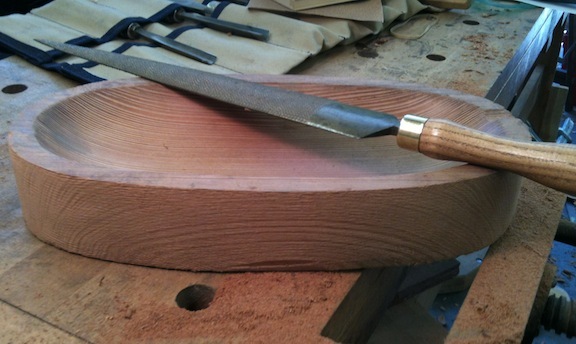 Once I had the profile of the bowl chiseled to shape I cleaned it up with a rasp. 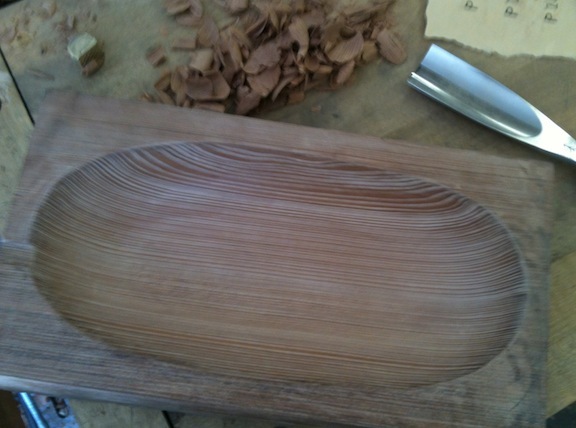 Then I started carving the outside of the bowl. I originally planned to leave two feet on the bottom, carving away the rest. I had too many problems with splitting (even cutting across the grain in a few spots) so I had to abandon that approach. 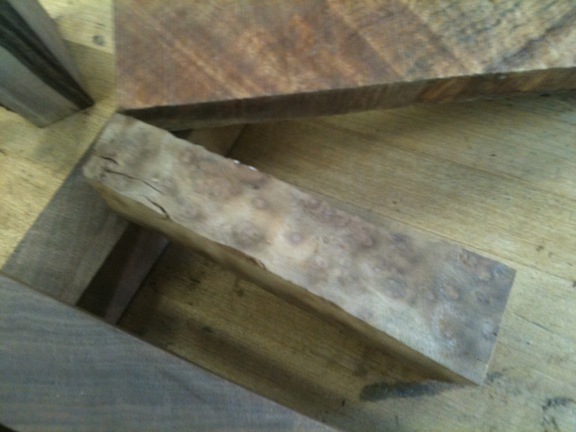 I think my gouges were plenty sharp, they were definitely slicing the wood nicely. I think this just was a problematic bit of wood to work. In the end I just planed a flat on the bottom so it would sit nicely. After gouging the outside I used a spokeshave to even things out, then a rasp and sandpaper. Since I had a few areas along the rim that had chipped out I decided to use that as a design feature and worked all the way around the lip with a gouge. One coat of “Tried & True” oil/wax finish and I’m calling it done. Strike that, I put another coat on yesterday and let it soak in the sun for an hour. The color darkened up nicely. Not great, but certainly serviceable. I may do one more, or just move ahead to the stool project. By the way, the “lesson” here was for me. Spoiler Alert: watch the grain. I’ve watched the first three of Paul Seller’s videos so far. I want to try the various projects and techniques he shows as I’m watching them, and shop time has been scarce. 6th grade finals for my son, re-org at work and assorted minor dramas that keep life interesting. I had so much fun with the spoon carving I decided I’d do another. Global Wood, which I’ve blogged about before, is near my office. That can be a good thing or a bad thing, depending on your perspective. I tend toward the former, other members of my family the latter. I stopped in a few weeks ago and picked up some interesting scraps. A couple of subtly colored bits of Claro Walnut, one interesting piece with a bold bit of sapwood and one that is sort of outrageously colored/figured. Also a small offcut of Camphor Burl. The Camphor made me nostalgic. I made a drawer for a wall cabinet years ago from a bit of non-burled Camphor. 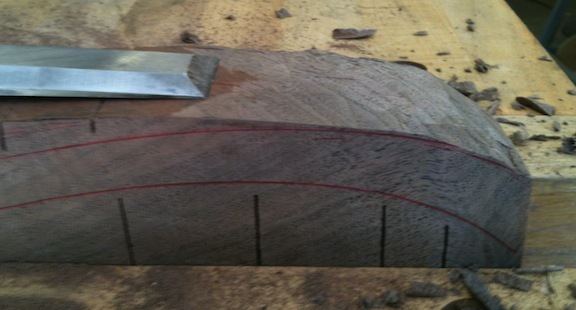 It was a small flitch that I had to re-saw, joint and thickness plane into submission. I ended up ankle deep in Camphor chips, the entire shop awash with the fragrance of Camphor. It was amazing. I think I can make a small coffee scoop from this piece. Marked one one on the Claro blank and made some relief cuts. 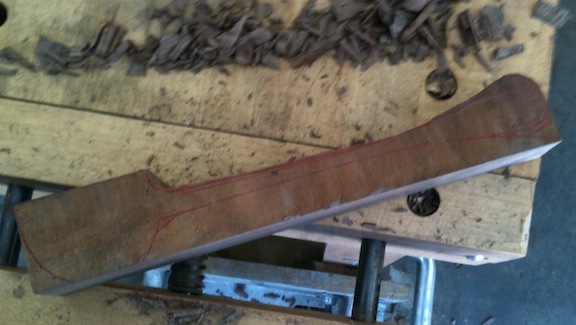 I started with the outside curve, using the chisel bevel up. I’m cutting across the grain with little chance of splitting bits off. I’m using a plastic-handled Stanley chisel here, nothing fancy. It’s one that I had laying around, it was pretty nasty but I ground and sharpened it and it does a nice job on this work. But when I started working the other way, bevel up of course, disaster struck. Looking at the picture it’s obvious what happened and what I did wrong. The grain is very clear, but problems are always clearer in retrospect. I should have been taking much smaller bites when working here. The grain is going down, the shape of the handle is going up and this piece of wood is going in the kindling pile. Rut-Roh…What Did I Do Wrong? Back to square one. At least this mistake didn’t draw blood. 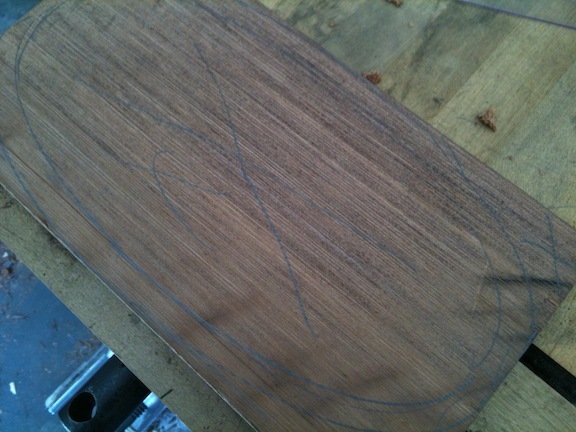 This time I resolved to pay more careful attention to the grain. Part of the problem is that there are long gaps between time I can steal away to the shop. When I do get out there it’s been at least a week, lately it’s been several weeks and I’m not quite focussed. Maybe I can do a few warm up exercises to get my fingers limber and my brain engaged next time. 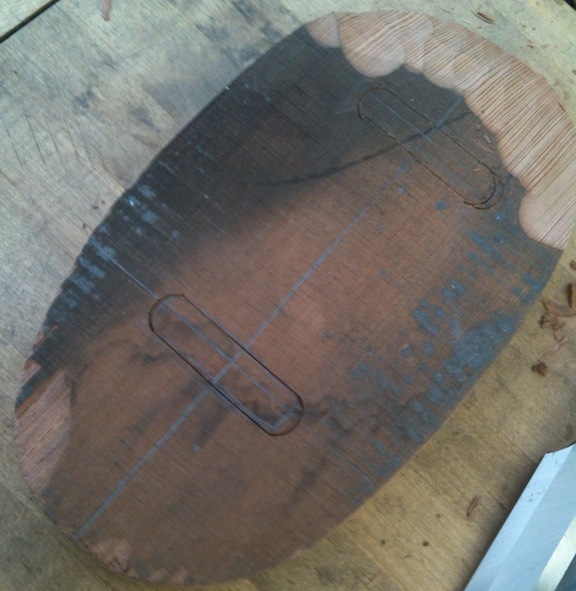 This time I looked at the grain, made a test cut to see how it was going to work and paid attention to it. At the beginning of the video you can see the part on the left edge where I made a test cut. See which way the grain wants to split? This is great practice, and fun to boot. 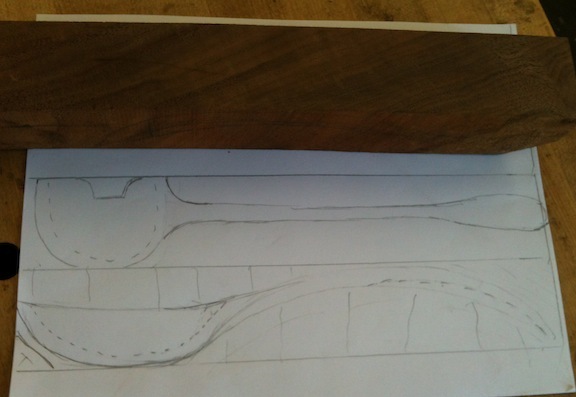 You could do it with a bandsaw, turning saw or even a coping saw too. 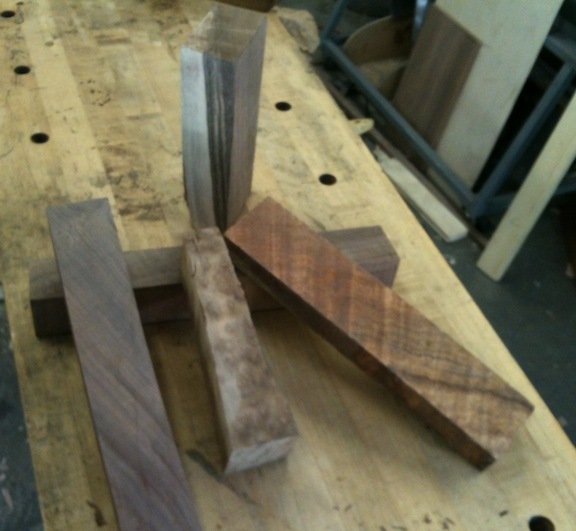 The real point, for me, is to learn how to use a chisel – not the end result. Even more importantly, to learn how to read the grain and account for that. And to learn how to focus on the project and take the entire effort into account so that the end result is something pleasing.